Colony collapse disorder (CCD) has been defined as the mass bee die outs experienced globally from the cumulative effects of pesticides, bee keeping practices, parasites and viruses. The honey bee, Apis mellifera, are now a mass global industry that help pollinate a third of the worlds crops and is estimated to contribute $360 billion to the global economy. Neonicotinoids have been blamed as a contributing factor for widespread CCD. The negative impacts of neonicotinoids from pesticides such as imidacloprid and clothianidin are noted in bio-cumulative and sub-lethal doses. Neonicotonoids are expected to attack the central nervous system of target insects resulting in eventual paralysis and death. They appear to impact the winterization of honeybees, as this is the most common period for the notable CCD to occur. CCD has been difficult to define, as it does not follow normal patterns associated with parasitism, viruses and climate change. The driving factor of the disease is associated with mass bee disappearance. Healthy hives are simply abandoned and studies are showing more then ever that those treated with neonicotinoids will suffer this impact. Numerous other studies have proven that the presence of these substances in certain doses can cause disorientation for bees trying to find their way home and have reduced the capacity of Bumblebees to produce queens. Biocides are effectively being blamed for numerous detrimental impacts that include physiological (reduced olfactory senses), behavioral (navigational difficulties), and learning (lack of flower recognition) processes. The US EPA is not doing enough; faced with literature supporting the negative impacts they are looking for further validated research, having invested $20 million into research, before taking action. They continue to allow for the use of pesticides but will not be ready to make or break allegiance with big chemical companies such as Bayer until 2016 at the earliest (and this depends on the product). They have recently decided to expand the use of some notably damaging pesticides thiamethoxam and sulfoxaflor, in spite of present research cycles. France was one of the first countries to ban the use of pesticides associated with CCD after suffering large losses to their commercial bee population. Since the ban France has seen some of its most productive crop yields in decades. 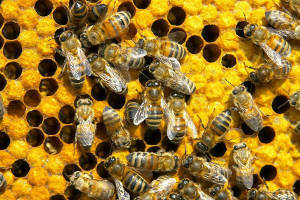 The EU has followed suit and placed a ban on the use of 3 neonicotinoids that harm bees. This decision is backed by intense campaigning and the European Food Safety Authority but was not uniformly accepted across Europe. The UK was one of the nations abstaining from supporting the ban, despite a wealth of data. The ban is the first step to potentially supporting our bee populations the way we should. A healthy bee population means a healthy food industry.